New York City has one of the world’s biggest subway systems, but some areas of the city are poorly served. While better bus service has helped, there are still large parts of the city, including low-income neighborhoods dependent on public transportation, that are out of reach of any transit. Building new subway lines or line extensions in the South Bronx, southeast Brooklyn. and eastern Queens would reduce travel times and fully connect these communities to the city’s transit system—and thereby job opportunities. Even though New York City has the most extensive subway system in the Americas, less than two-thirds of the city’s population actually lives within walking distance of a station. This lack of access is particularly acute in Queens, where fewer than four in 10 residents can walk to the subway. Over the last few years, the city has initiated a Select Bus Service (SBS) program to mitigate this lack of access, but the results have been mixed—SBS has been slow to be implemented, and is simply not on par with subway service. And so the city is full of neighborhoods that aren’t served by the subway or SBS, even though their densities justify it (roughly 20,000 people per square mile, or the average density of Middle Village or Canarsie). Of those, many are low-income neighborhoods, where households are particularly dependent on public transportation. Providing good transit options to all high-density neighborhoods, with a special focus on those where low-income households live, is a top priority. The regional rail proposal described in this plan, dubbed T-REX (Trans-Regional Express) would provide subway-like service and fares at commuter rail stations within the city. In the longer term, it would also provide new service in neighborhoods without rail access. The proposed Triboro line would also provide new rail service to residents along that corridor. Beyond these neighborhoods, there are others where new subway lines or extensions of existing lines are needed. They are typically high-density and low-income neighborhoods, with no subway service—although occasionally new lines are recommended to open up new housing and employment opportunities, or to increase line capacity. For example, extending the #1 line to Red Hook or the D line to the East Bronx could be justified in the future if these areas continue to develop. Each of the new lines and/or extensions are proposals that should be further evaluated by the Metropolitan Transportation Authority and the City of New York to determine whether their benefits justify their costs. Third Avenue in the Bronx developed into a very dense neighborhood more than 100 years ago, but ever since the elevated line was torn down in the 1970s, the neighborhood has had very poor access to transit. The T-REX proposal would provide robust transit service to this neighborhood by converting Metro-North’s commuter rail into a rapid-transit service. A terminal for the proposed Triboro line would also be located on Third Avenue at 149th street, connecting that neighborhood to Queens and Brooklyn. The Second Avenue Subway should be extended from its current terminus at 96th Street to the Grand Concourse line, connecting with the 2 and 5—and with T-REX at 149th Street. Extending the Second Avenue Subway to the Grand Concourse would increase service on the underutilized line, and provide Bronx residents with better access to jobs on the east side of Manhattan. A new 3.7-mile Northern Boulevard line should be built to serve the neighborhoods of Jackson Heights, North Corona, North Flushing, Mitchell-Linden, and College Point. The line would run from 36th Street and Northern Boulevard to Willets Point, continuing east to serve north Flushing and Mitchell-Linden, or turn north to pass under Flushing Bay to College Point. The proposed 5.7-mile Jewel Avenue line would bring service from the Queens Boulevard line to the transit deserts of Pomonok and Fresh Meadows in Central Queens. It would bookend the new T-REX Metro service along the LIRR main line in Hollis and Queens Village. Ridership on the Astoria line is expected to increase dramatically as the population grows in western Queens. A new terminus and yard capacity/train storage would allow for more frequent service to accommodate that new demand. Instead of today’s two-track stub-end terminus with no storage, a new yard should be constructed on an industrial site on the northern side of Ditmars Blvd along 20th Street. With this new yard, the line could be extended west toward the East River to cover a part of Astoria that is dense and currently far from the subway. The extension would also place the line within walking distance of Astoria Park. Although this short new extension would be only 0.8 miles long, it would upgrade line capacity and reliability. Only a few pockets of Manhattan are not covered by the subway. The T-REX will provide new transit options in the borough’s busiest corridors, and improve coverage for the edge of the upper west side. It would also make it easier to get across town at 57th and Houston streets, and to travel up and downtown on the east side along Third Avenue. After these improvements, the places that still lack coverage would include the far west side in midtown north of 42nd Street, the Lower East Side (east of Ave A), and East Harlem. The Second Avenue Subway should be extended from its current terminal at 96th Street to 125th Street and Park Avenue, and then continue westward along 125th Street to Broadway. In just three miles, it would cover the unserved lower-income neighborhoods of East Harlem and Harlem, and connect to seven subway lines (four stations), the T-REX at Third Avenue, and the 125th Street Metro-North station. The extension should also plan for a separate Second Avenue extension up to the Bronx, as described earlier. Extending the #7 train from its current terminal at 34th Street down to 14th Street would improve access to the underserved areas of Chelsea and Meatpacking, which could also allow for more office and job growth. The extension would also improve access to the Hudson River waterfront from all parts of the city, and would connect the #7 with the L and A/C/E lines. RPA proposes extending the line on a gradual diagonal from 25th Street and 11th Avenue to Ninth Avenue and 14th Street, with a Station at 25th/23rd between 11th and 10th Avenues. A subterranean pedestrian corridor would connect the L and #7 along 14th Street between Eighth and Ninth Avenues. After the new terminus at 14th Street the line would extend down Hudson Street to 11th Street to restore the tail-end tracks. This extension should be designed so as not to preclude future extensions, including to New Jersey. Brooklyn has experienced tremendous growth over the past two decades, mostly in areas already served by the subway. The next wave of growth is likely to occur in Crown Heights, Brownsville, East New York, Flatbush, Midwood, and the Flatlands, which will put tremendous stress on the existing subway system. The T-REX Atlantic line would provide supplemental capacity for some of these neighborhoods, while others would benefit from the Triboro line. But even with these two services, several neighborhoods in southeastern Brooklyn would still be unserved. They are East Flatbush, Flatlands, Marine Park, Mill Basin, and Sheepshead Bay. A new subway line should be built under Utica Avenue, from Eastern Parkway to Flatbush Avenue, extending the #4 by four miles. 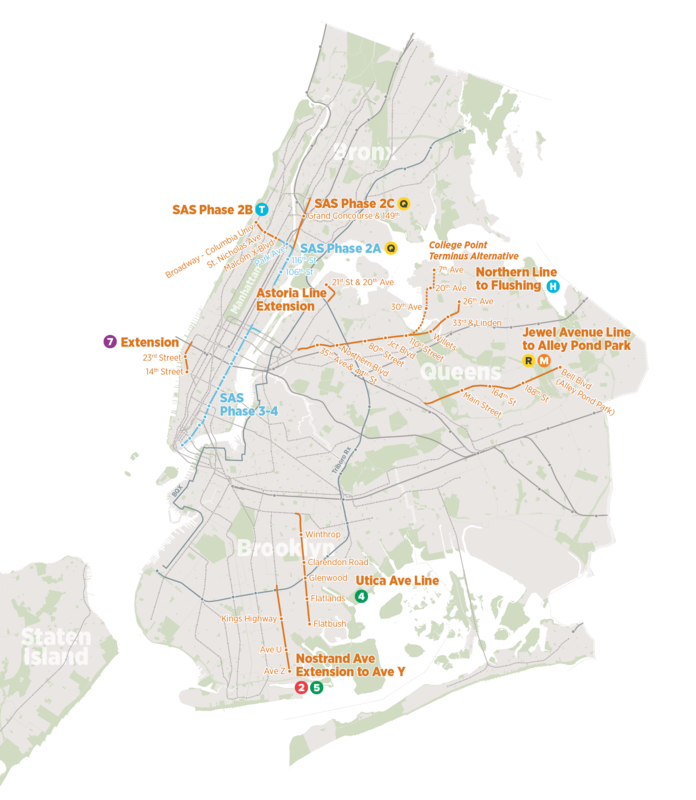 The Utica Avenue subway would bring new rapid transit service to parts of Crown Heights, East Flatbush, Flatlands, Marine Park, and Mill Basin. It would also connect the rest of the city with Jamaica Bay—specifically, Floyd Bennett Field and Marine Park. Several of these neighborhoods are already served by express buses, but bus service is slow and only peak-period/peak-direction. The City of New York recently funded the MTA to study this line, and an assessment should be forthcoming. The Nostrand Avenue line should be extended 2.7 miles south to Avenue Z. This short extension would enable the #2 and #5 subways to provide service to the remaining portions of the Flatlands, Midwood, Marine Park, and Sheepshead Bay. A direct connection to Marine Park/Floyd Bennett Field would be possible if a pedestrian/bike bridge were constructed over Shell Bank Creek. Staten Island poses difficult questions about investments in public transportation. The borough’s current population and job densities make it difficult to justify the large capital expenditures that rail requires. But extending the proposed Triboro system via a new tunnel under the Narrows and integrating the SIRT operation into the Triboro line could have multiple benefits. This improvement would directly connect passenger and freight rail service from geographic Long Island to Staten Island for the first time. SIRT customers would also gain the ability to reach parts of Brooklyn, Queens, and the Bronx, and connect to over a dozen subways and regional rail. These new services would substantially reduce commute times for New Yorkers and improve access to neighborhoods, which means more choices for jobs and housing. Expansion of the mostly underground subway system would reduce the number of surface transit trips and ease traffic congestion, providing more space for repurposing of roadways for pedestrians, bikers, and goods transporters. There are also opportunities for more redevelopment around stations, in some cases short-term, and others in the future. Finally, these improvements would substantially improve access to major open spaces, such as Alley Pond Park and Floyd Bennett Field. These improvements would be funded through state and federal grants, along with revenue-backed financing. The MTA should also take advantage of opportunities to capture some of the value of real estate development that could occur along the corridors as a result of the new subway service. In most cases, these projects would only be feasible with reforms to planning, approving, managing, and constructing rail projects that RPA is also is proposing as part of the Fourth Regional Plan.